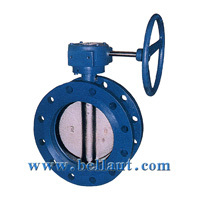 Manual-operated Flanged concentric butterfly valve by Tianjin Bell Automatic Instrument Technology Co.,Ltd. Nominal diameter: 50(2”)—300(12”)mm 50(2”)—300(12”)mm Nominal pressure:1.0 MPa 1.6MPa Operating temperature range:-15—+150? Suitable mediums: fresh water, sewage, air, etc Features: ?rubber vulcanized into inner valve body, without any leakage in the connecting point. ?hard rubber liner without movement, high reliability, more than then thousand times of rotation operating experiment (circle),longer operating life. ?reasonable rubber and valve seal design,small torque, high sealing pressure,tight junction free of bubbles. ?flange connections, used in the end pipeline end. Demount up or low part of pipeline during maintenance at will. Manual-operated Flanged concentric butterfly valve by Tianjin Bell Automatic Instrument Technology Co.,Ltd. at Pakbiz.com a premier Business to Business marketplace and largest online business directory. Find Manual-operated Flanged concentric butterfly valve from China complete basis & contact information, business offers, availability & related Electronics & Electrical products. This page gives you information about the authentic sellers of this product. It allows buyers and sellers communication directly. It can also facilitate the buyers to purchase the product in reasonable prices.